Jasonred Dead. 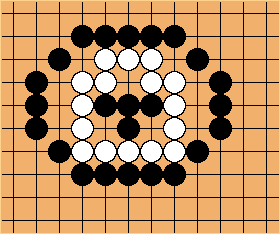 Looks to me like Black can play tenuki all the way, there's absolutely no way White can save himself even with three moves in a row? ChrisSchack Agreed. By the way, I added the diagram in, it's useful to see. Jay? Well, yeah, but it would be seki if black could not also kill white. In this case, black can make a rabbity six along the way.